Do you ever sit and think about the gravity of the job you have as a parent? Really just let you mind process what you are responsible for and the great impact you have on your children? I know I definitely do and I imagine anyone who is the type to be out reading advice on parenting is thinking about the same things. I think sometimes we give ourselves too much credit and/or too much pressure. Yes, as parents we have a huge impact on our kids, but children are resilient and they can learn to respond to situations. But more than that, I think we are seeking some magical formula that surely must take loads of effort that will produce a happy, balanced adult ready to face the world. I think the formula is easier than we might imagine. We don’t have to do big, huge, mind-blowing, viral Pinterest-worthy things in order for them to have a big, huge, mind-blowing impact on our children’s lives. They are simple. They are simple in theory, but often prove to be more challenging in practice if we don’t give them the respect they deserve. I want to address one of these simple things we can do to have a big impact on our children: family meals. A family meal is when the family eats a meal together–all at the same time and all in the same place. I would also propose this is done free of any technological distractions–no TV, no phones, nothing. Nothing but each other. Children are physically healthier–both in what they eat nutritionally and in how they are physically. This also leads to less anorexia/bulimia and fewer overweight children. I think those are pretty compelling reasons to put the necessary effort into making family meal time a reality. Then of course you might wonder the old chicken and egg thing. 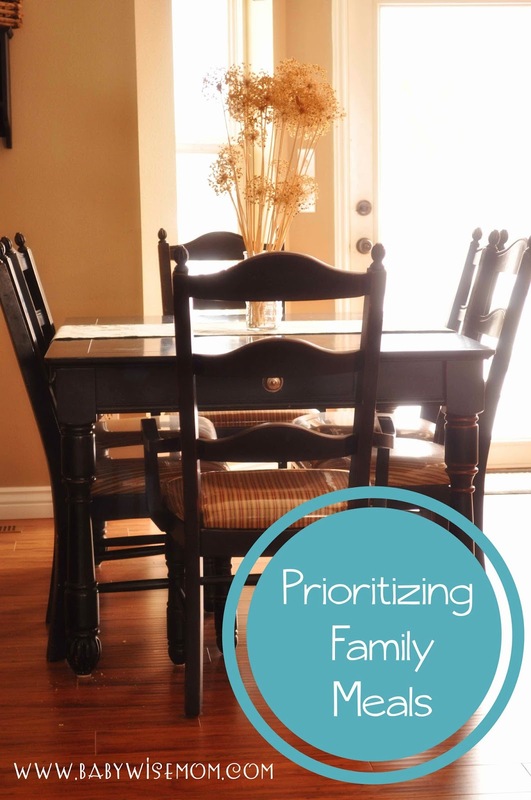 Is dinner really that important or is it just that families who eat dinner together are more likely to be doing other things that are actually what is important–in other words, do I really have to make dinner a priority if I am doing a bunch of other things right? The study I cited earlier considered this. It factored in other family connectedness considerations and found that the actual act of having family mealtime was indeed an independent factor that did impact the lives of teenagers–especially teenage girls. There we have some reasons why a family meal is important. I think most of us can simply eat a meal as a family and recognize that yes, this feels good. I feel good. It feels right and it feels like something I should make an effort to make happen. We don’t need all of these peer reviewed studies to point out the reasons why a family meal time each day can be a good benefit to our child–it is common sense. But even so, most of us are not having meals together. The trouble comes in the implementation. I think we get that it is good advice, but we have a hard time making it happen. It sounds simple enough on paper. Everyone needs to eat dinner, so let’s just do it all together. Often you hear of the difficulties with making family meal time happening when you have older children, but it can even be hard to do with little kids if parent’s work schedules aren’t friendly to allowing a family meal to happen. A family meal is important enough for you to sit down and do some brainstorming to figure out how to make it work. Start now–it won’t get easier as your children get older. I have written a post with ideas on making it a success with babies up to about pre-toddlers. You can read that here: https://www.babywisemom.com/2011/10/family-mealtime-preparing-for-success.html. Here are some principles to follow for making family meal time a reality in your home. Start by deciding which meal you will have as a family. You can have all meals if it is possible, but if not, choose which one can be the one everyone attends most days. For some, that might be dinner. For others, breakfast might be easier to make a reality. Choose at least one meal that will be your family meal time each day. Next decide what time this meal will happen. Think through your activities each week and decide what time it can and needs to be. If it needs to be later in the evening, plan a late afternoon snack so children can make it to dinner time. Next plan out your “plan B” for when things will come up that interfere. What will you do if an activity comes up during that meal time? What if an activity comes up before the mealtime and it will push dinner late? What if an activity comes up right after dinner–how will you make it work still? Plan ahead. Know what you will be having for dinner. Buy what you need to make it. Know what time you need to start cooking it so you can eat when you need to eat. Have kids help. Children can help make dinner. They can help do other things so you can make dinner. They can entertain themselves so you can make dinner. Expect your kids to step up and contribute how they can to make this a reality. Don’t let laziness take over. I attribute a lot of what we don’t accomplish to laziness quite frankly. I know that is blunt, but I think it is truth. It is the bare-bones, no cottling you answer as to why something doesn’t happen. It is because we don’t do what it takes to make it happen. Yes, sometimes things come up that prevent us from being able to have a normally scheduled family dinner. That is understandable and expected. But if the norm is that dinner isn’t happening, there is something you or your spouse are not doing in order to make it happen. Study after study finds immense benefits to having family mealtime together. Don’t be lazy about it. I believe this is important. So much so that I am confident that if you wan to make it happen and can’t think of a way to do it, if you pray for guidance, you will get it. You will be able to find a way to make it work most days. Be flexible when needed. Remember your “plan B”–when things come up, be willing to be flexible to still make it happen. Keep meals simple when needed. You don’t need gourmet meals in order for family meal time to be valuable. Not at all. If things come up that make it hard to make dinner, it is better to have a simple dinner together as a family than to bag the meal time all together. Start now. You can always change the rules in your home, but the younger you start prioritizing family meal time, the less of a battle you will fight when kids are older. Establish the ritual now. Remember the story of King Naaman. The story is found in 2 Kings Chapter 5. King Naaman had leprosy. He was counseled to go to the prophet to be healed. He traveled to visit the prophet. The prophet Elisha didn’t see him personally, but sent a message to dip in the river Jordan seven times. Naaman was offended and also disbelieving in such a simple task. He refused to wash in the river Jordan. His servants said to him, Look. If the prophet had asked you to do some big thing, you would have done it. So why not do this simple thing? So he did it. And he was healed. You don’t need some big thing. This is a simple, non-glamorous thing. Doing it won’t earn you fame, fortune, or even slight recognition. No one will be particularly impressed. But it will make a positive difference. Probably even a huge difference in the life of your child. Do you have family meals? What creative ways have you made family meals work? Do you believe in the importance of family mealtime?